This has been an interesting couple weeks of politics, getting sick of politics and not listening to myself about politics. I’ve been twittering and spouting off about politics because it riles me up. Because I disagree. Because I hear things that strike me as wrong and I want to respond. And what I failed to realize is that so often we just disagree (like I said before and then ignored) and pouncing on each other doesn’t help. I’m sorry. I think politics would be a lot more friendly if we could cut out the rhetoric and just focus on an issue. If we could see where and how we disagree and just be fine with disagreeing. It’s easier to find a path forward if you understand where the other person is coming from. Too often in politics (myself definitely included), we don’t take the time to do that. Instead we jump to the conclusion that you must be stupid. That’s probably why I don’t usually talk much about politics (I tend to disagree with the standard Christian/Republican stance) and why in the past two weeks of talking more about politics I’ve annoyed some people and riled up others. Not that frustrating or riling is bad, but I’m not sure what I’m accomplishing. So let’s accomplish something. My sister-in-law took one of those online quizzes that tell you where you’re at politically. These things are always goofy because on some questions I hem and haw and then wonder if I had answered differently if it would have changed the outcome (I checked, it didn’t change much). But at any rate, I think it can be helpful to see where we stand. So give it a try. It’s about 40 questions and takes less than five minutes. Done? And now I’m going to talk about the results, so to really be fair you should take the test and post your results in the comments. My results: I’m a Democrat. Socially permissive and not so much economically. I’m fairly permissive on social issues. Let people do what they want to do, within reason. As a Christian this stance makes sense for me because I don’t think you can legislate morality. As Barack Obama said in a much mis-characterized speech, “Who’s morality are you going to legislate?” This is the same social position Libertarians hold (founding father Thomas Jefferson is the poster boy in that camp). Economically I’m less in the free market and more in the let’s help each other camp (notice that I get pretty close to socialism). I think people need help from time to time and the government should help them out. I think the rich can afford to help the poor within reason. This is perhaps best illustrated in comparing Barack Obama and John McCain’s tax plans. Obama raises taxes on the wealthiest, and cuts taxes for the middle class, with more of a spread the wealth mentality. McCain does practically the opposite with much smaller tax cuts for the middle class and much larger ones for the wealthy, with more of a trickle down economics mentality. I’m no economist, so maybe that’s an unfair characterization, but I think in general that’s accurate. Personally I don’t think McCain’s strategy works because people are inherently greedy. Just because you give the rich a tax cut doesn’t mean they’re going to spend it in a way that helps the rest of us. At any rate, it’s interesting to see where people land and why. I noted that as a Democrat I landed fairly close to the Socialist camp. But if you’re a Republican there’s a danger of landing pretty close to the Fascist camp (which explains my dislike for the strident nationalism of the Republican party). Just for kicks I tried to take the survey as a fascist and ended up a strong Republican. I don’t mean that as a slam, but it shows two things. First, it’s hard to get in somebody’s head and know how they think (it took me a few tries to get a Darth Vader result). Second, what I thought was being fascist really wasn’t. And it goes all ways (what you take for anarchy may be Libertarian). So I hope that gives some framework for understanding politics. It’s kind of funny that the major political divide in America is between socially conservative and economically permissive Republicans and socially permissive and economically conservative Democrats. They’re polar opposites on those issues. 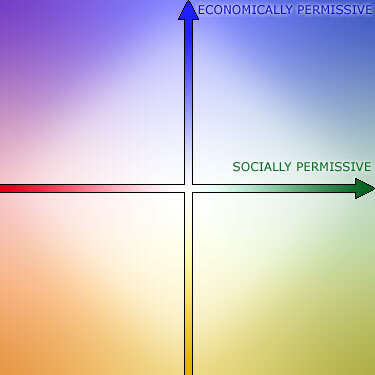 Disregarding everything I know about politics, I’d expect to see the major divide be between control (Totalitarians) and permissiveness (Libertarians), because at least they’re both consistent (all control/no control). And as a side note, I think it’d be incredibly interesting to study this kind of thing throughout governments throughout history. For example, where did Franklin Roosevelt fall on this chart? Or Jefferson Davis? Martin Luther King Jr.? Mother Teresa? And on back into history. Some are pretty obvious, but others are less clear. Where the rubber really hits the road is that I think it helps to understand this when we talk about politics. Because too often we line up on our sides and sling arrows at each other (I’m just as guilty of this, as I’ve proven this week). But in reality we’re not going to get anywhere that way. Our ideologies are opposed. It’d be easier if we just acknowledged where we stood instead of attacking each other. Unfortunately, I don’t know many people who are good at doing that. It’s more fun to just crack a joke. In the end, I think the reason I got so riled up this week is because I see so many Christians who think the Republican approach is the only way to go. And that’s just not true. Sometimes I feel like I’m going to be blacklisted (again) if I vote Democrat (and for a reality check, some people would not only blacklist me, they’d send me to hell, as Sarah Palin’s former pastor has said). Unfortunately this chart doesn’t really show defense very well, but I think that issue makes my divide with the Republican side all the more clear (that’s another blog entry). I guess I need to realize that my way isn’t the only option either. And while Claiborne and Haw are talking about the church, I think learning how to disagree well would do our larger society good as well. “Tim – and what happens if not enough people contribute to those non-profits? I don’t think that would be an issue. I’m with Limor that people are inherently good. That is, at least enough people are to cover the needs that are at issue. Especially with lower taxes where we have more net income and can give more to charities. There are typically not a shortage of charities, either, since that’s another source of jobs as well. Tim, although I disagree with you on several key issues, I appreciate how well developed your perspective is. I enjoyed reading your response. I think some of your points are valid, I’d have to say that I disagree with your idea of moving those in need of welfare to what basically is a ghetto. Putting them up in dormitories and rationing out their money etc – doesn’t that seem a little like treating them like second class citizens? So now, not only are they poor and in need of help, they see themselves as second-rate to everyone else. That’s going to take an awful lot of counseling to pull them out of that mindset. That last comment was me – for some reason I was logged in as Kevin. It sounds like you’re still embracing a fair amount of government, certainly more than the police, army & courts that Limor advocated. While I obviously disagree on some of that, I think you still have government providing a lot of the basic protections, and I can live with that. It’s the idea of leaving just about everything up to businesses or charities or whoever that makes me uncomfortable (Sorry, Limor). But I guess that’s why we disagree. I’d think of it more like an organized homeless shelter. The *whole point* is that it’s not comfortable, and that they’ll want to get out of there. The charitable organizations would be all over it assisting whomever is the least bit willing to get out of that situation, and would provide a huge efficiency in concentrating care toward that area. They’re already in the ghetto, so I don’t see a difference other than they’d gain new friends who are empathetic and may be more likely to exchange child care while working, etc. Many of the problems stem from single parents – put two single parents together and you just have a large family now. Not necessarily shared finances, but at least shared workload. Better than the current situation many times over, and less costly as well. Take it one step further: concentrate more police in that area, so they can be more efficient as well, since crime is likely to be higher. Sound draconian? Not once you see a few factories and warehouses show up next door and can employee dozens or even hundreds, with no transportation issues, etc. Something I forgot to add to my first paragraph above.. The problem with welfare is there is no incentive to get off of it (as Limor noted). Making it uncomfortable is a step toward freeing them from it – consolidating just happens to bring many other benefits as well. I suppose if we had to have welfare, Tim’s idea for it sounds pretty good. You’re basically giving people something for nothing. Something that other people had to work for, so frankly I don’t think that they have a right to complain and be picky. If they don’t like it, they can get a job. When NY decided to make welfare recipients clean up streets and park, they actually complained about it and said that it was demeaning and beneath them. In MI, a few years back, people who got section 8 housing, complained that they had no A/C. There are lots of people out there working 2 or 3 jobs, doing work that most of us would find unpleasant, living without A/C, who are NOT on welfare. I would much rather help those people out, than people who don’t want to work. I have all sorts of personal examples of welfare fraud, and other ways in which the system is basically being abused by those one it. It’s really common. I’m not saying that everyone who gets some sort of aid is a cheater, but I think that unfortunately a huge number of them are. limor, have you ever befriended anyone on welfare, or spent any time getting to know people from an impoverished community? if you have, then I can agree to disagree with you. if not, I would highly suggest you take a step out of your comfort zone and walk alongside some of these folks for a season, and see if some of your black and white stances on issues don’t get a little grey. They are already in pocketed areas (ghettos – although some section 8 housing is far better than others) and I don’t think that too many people are rally together to combine their resources. Not to mention the fact that often times there already is a large family support system in place (grandparents/aunts/uncles/2 parent households) are already helping to care for younger kids, etc. This may help clear things up (at least clear up my perspective). I consider “welfare” a large umbrella of government assistance. I see things like unemployment, section 8 housing, gov’t health care, day care assistance, food stamps, WIC, etc. to all fall under “welfare” and in many of those cases people are working or going to school. Moving these people into one area and treating them as second class is simply going to take away their self-worth. It’d rather see middle/upper class people move into the neighborhoods that are the “bad” parts of town and try and mentor/be examples/assist the people who are currently there. Limor, there are always going to be people who complain about what they don’t have and want more than they truly need (see my statements on greed) and while the government may not give them the AC or jobs available they still have the right to voice their opinion. And you are right, there are too many cases of welfare fraud – and that’s a huge area of the system that needs to be fixed. limor, you may also be surprised to find that while your financial wisdom and decision-making may far surpass many of those in a “bad neighborhood”, those who live there have much to teach/mentor you in as well. Michelle, you’re making a lot of assumptions about me, none of which are true. I have personally known (befriended if you will) people who have, at some point, been on welfare, but got themselves off of it. They used it the way it was meant to be used. I also befriended someone, and later found out they were screwing the system. It was a huge disappointment to me. When I, in a very diplomatic way, pointed this issue out, I got chewed out in the most disgusting way. I have also worked with lots of people on assistance, and have seen, 1st hand, how much abuse goes on. When someone gets their hair and nails done on a regular basis, buys designer clothes, and eats out at restaurants, all while taking taxpayer money, I have a BIG problem with them. I also have a problem with supervisors lying on paperwork, so that their employees can get assistance. These things happen, all the time. I am also sick of this born into poverty=can’t get out of poverty notion. None of my grandparents had any money, they are all from Poland. Jews in Poland did NOT do well. They didn’t have access to all the things the privileges that their gentile counterparts had, and they could be summarily beaten or killed. When they moves to Israel (Palestine at the time), they also had nothing. They had to work really hard to built themselves up, and be able to invest in their children. You still have a lot of people, from all over the world, who come to Israel to work, and then send money home. There are a lot of Africans, Philippinos, and others, who are willing to work hard in order to invest in their own families. You see the same thing in various immigrant groups here in the US. I don’t feel sorry for someone who has decided, that much like his/her parent/s and grandparent/s they are going to be on welfare. I don’t feel sorry for someone who sees each additional child as an added paycheck or boost to their housing allowance. I don’t feel sorry for someone who lies on their paperwork, or purposely avoids getting married, in order to qualify for assistance. Especially not, when I used to work 3 jobs (60 hours a week). first of all let me apologize if i came off in the wrong way. i don’t mean to make assumptions, however, i have to be honest and say that some of your writings have rubbed me the wrong way. i am not seeing where your philosophy about the nature of people lines up with your fury about welfare recipients, whom you seem to lean towards saying are for the majority greedy and lazy. i tend to agree with abby in saying that left to our own devices, our sinful nature prevails. i too know many people who abuse the system which is in place. i also, like you, know those who have used it and worked their behinds off to become independent of it. my husband grew up in housing projects and his mother worked numerous jobs around the clock to provide a better life for her children and has been a homeowner herself for many years now. my husband, despite his meager public education, worked about 10 times harder than i had to in order to become the first in his family to graduate from college. he took the small earnings from the non-profit he worked for after college and has invested it wisely in real estate and become financially successful. he coaches high school football and works tirelessly to educate those kids about how to make wise life choices, including how to work hard and manage money well. so i have also seen first hand that those born into poverty clearly do have a way out. however, the reason why i asked you if you had spent much time in relationship with someone on welfare was because it seems your views are so cut and dry. “People who have self respect wouldn’t continue to be parasites.”in my opinion, there are so many different factors that play into ones life circumstances, you can hardly make such general statements. what if your education is so sub-par that it is not an option for you to just “go out and get a job” that will pay for your expenses? what if you are working so many jobs to stay afloat that you can not spare the time to further your education? what if you had to drop out of high school to help your parents pay the bills because they didn’t know how to manage their own money? or because their jobs simply didn’t pay enough?? it is too complex to boil down to “go get a job”. again, i find your train of thought to be a bit offensive. many of these so-called dumb morons have simply not had the chance to be educated in these particular areas of finance. i surely would not ask you to feel sorry for someone who lies or cheats, i don’t feel sorry for them myself… what i would ask is that if you are going to assume people are inherently good, don’t x out a particular group of people in that assumption. just like the rest of us, there are those on welfare who make good and bad choices with their lives. it is clearly not a perfect system, however, i feel it is necessary. what is even more necessary is for people to stop seeing things as so cut and dry and writing off entire groups of people. for instance, immigrants are not the only ones in the u.s. willing to work hard in order to invest in their own families and bring themselves out of poverty. however, even that, in my opinion, is not nearly as simple as you make it sound. again, please forgive me if i’ve said any of this in an aggressive manner. the written word is a beautiful thing but it is all too easy to read behind the lines and find a sentiment that wasn’t intended. so if i have done that with you, i apologize. p.s. all this being said, i don’t think money is the be all end all solution. better educational opportunities would be a huge step in the right direction, in my opinion, for those trapped in a cycle of poverty. michelle, you’ve summed up very nicely a lot of what I’ve been wanting to say. I agree with you that money is not the end all solution. I’ve never understood why society feels that just by donating money all our problems will go away. To me, that seems to be a very temporary fix on a very long term problem. Education, counseling, job training, on-going mentoring, financial planning, teaching how to set long term goals – all of this needs to be included along with the monetary aid. And, to go back to the “political” debate, this is why I feel we still need to have the government involved in these type of services (a better system, yes, but still involved). I know we’ve discussed the possibility of non-profits taking over these roles but it worries me to leave it to organizations that can discriminate. If they don’t feel people are trying hard enough or they are too lazy or…they can deny them the money. People may also choose not to donate to these agencies because they don’t want to support its particular cause. I simply do not think there are enough people willing to donate enough money and services to provide the amount of help that is needed in our country. This isn’t incongruous with my opinion that most people are good. Most people aren’t on welfare, and even some of the people on welfare, are only using it temporarily, and for the right reasons. If someone has already made the decision to live off of someone else, instead of providing for themselves, then by definition, they are not good/decent/moral. Your husband and MIL, obviously didn’t want to stay on welfare. they obviously respected themselves enough, and were decent enough to improve their lives. I know it isn’t easy. It wasn’t easy for my grandmother to go to work at 14, it isn’t easy for my grandfather to work very long hours, it wasn’t easy for any of them. Life isn’t easy for most people, but you don’t just throw your hands up in the air and say “I quit” and then let someone else pay for your existence. I know a lot of people who had to work their way up, and I don’t see anything wrong with it. I’m Jewish (not to mention an Objectivist), so this whole sinful nature/people are inherently evil, doesn’t apply. It’s a Christian construct, which I think has really done a lot of harm, but that is beside the point. As for the mortgage statement, it’s simply a statement of fact. It has nothing to do with education. There are plenty of college educated morons who took out loans that they couldn’t afford. There are also lots of people who used this opportunity to buy houses that they wanted to “flip”. That is moronic, irresponsible, and it’s their own fault. Education doesn’t necessarily have anything to do with good sense. I have met plenty of people with college degrees (some of them advanced) who had no sense. I’m not going to use the term common sense, because it doesn’t seem to be so common any more. I didn’t think that you were saying anything aggressively, and even if you had, I’m totally fine with it :) I just didn’t like that you were assuming that I had never known any poor people, or people on welfare. I don’t believe in situational ethics. Either something is wrong or it isn’t. I’m all for moral absolutes. Sometimes it’s hard to be moral, oftentimes it is, but that doesn’t change the rules. That is why when someone that I worked with closely in school, revealed to me that she was lying on her paperwork in order to milk the system, I had to point out to her that it’s unethical. It wasn’t pleasant, I didn’t want to do it, and I figured that it would pretty much end our friendship, but that didn’t change the fact that it was the right thing to do. Doing the right thing is hard. It doesn’t win you friends, will often cause you to lose an election, and generally make life more complicated for you, but it’s still what you should do. I know people who have suffered for doing the right thing, people who have spent years as political prisoners for it. They don’t have any regrets. I don’t think anyone is advocating for situational ethics here. I think they’re talking about having compassion for people in difficult circumstances. wow… limor, i kept meaning to reply to your post and it has been almost 2 months! woops! well, i just wanted to put in one last word on this subject and say that no, i definitely do not believe in situational ethics. lying is lying, cheating is cheating, etc. what i meant to convey was the idea that i don’t believe it’s appropriate or fair to make a blanket judgement about the morality of a certain segment of society based on where they receive their income. “If someone has already made the decision to live off of someone else, instead of providing for themselves, then by definition, they are not good/decent/moral.” from what i’ve seen it is not always so simple as “making the decision”. i guess that’s what i’m taking issue with.